Earlier this week, we talked about how to simplify dinner, in particular a favorite Italian dinner, with just one skillet and a few ingredients. Now, let’s turn our attention to breakfast. Mornings are by far the busiest part of the day for my family. I’ve taken measures to simplify this time with morning routines. Even with these routines in place, our mornings always feel full and on the verge of being slightly crazy. Need an example? Just last week, after enjoying a fairly smooth morning (AKA: lunches were packed, everyone ate breakfast, everyone woke up on time, and we left the house on time), we arrived at school only to find out that one of the kids left their shoes at home (20 minutes away from the school). Need I say more? Life with kids is always full of surprises. Mornings are smoother and calmer, even with shoes left at home, when there’s food prepped in the fridge. Since both breakfast and lunch need to be prepared and packed in the morning, that’s what I focus on during my weekend food prep time. Let me just pause for a moment, because when it comes to food prep I think there’s a misconception floating around. It’s easy to think that prepping food in advance means “making all the things.” It’s not. That makes for a great Instagram photo, but can also lead to overwhelm and burnout. <–I know that from experience. 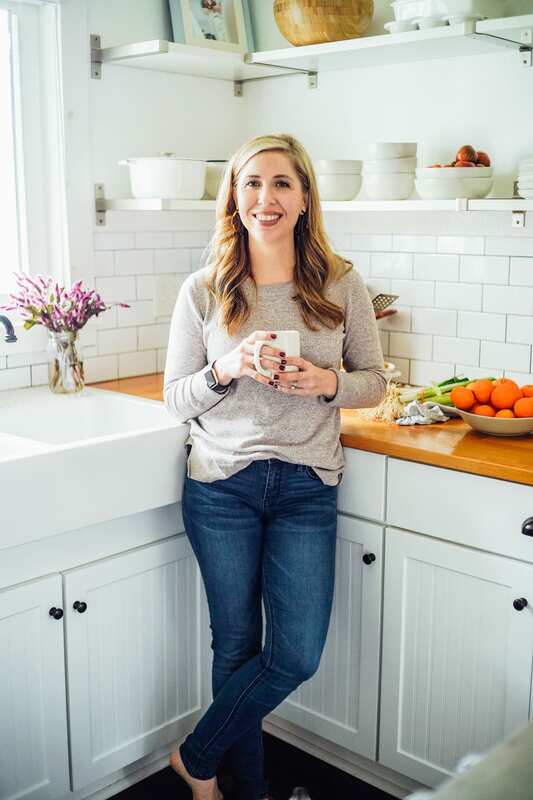 Food prep is about intentionally making food that will simplify the week based on your schedule. That’s it! Food prep is a way to simplify life. It’s not something that’s meant to feel burdensome or complicate life. Our schedule is the fullest in the morning and through lunch; evenings are more relaxed. This is why I focus on prepping breakfast and lunch on the weekend. What is prepped is always based on our schedule and my meal plan. Sometimes this looks like making one simple breakfast so Monday and Tuesday are smooth and manageable. Other times this means doing a bit more due to an upcoming busier season. 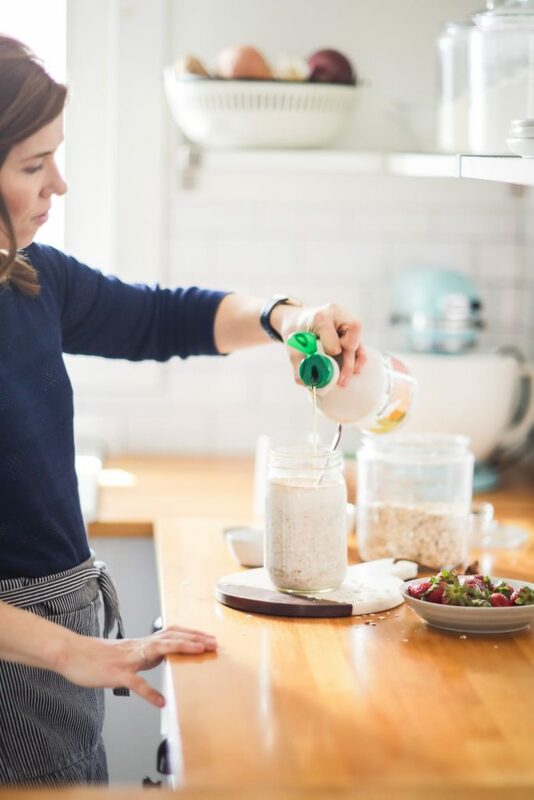 One of my favorite make-ahead breakfast options is overnight oats. 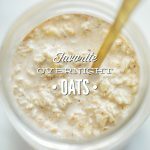 There are so many different overnight oat recipes online. Today, I want to share my favorite recipe. A recipe that was created after trying many different overnight oat interpretations. 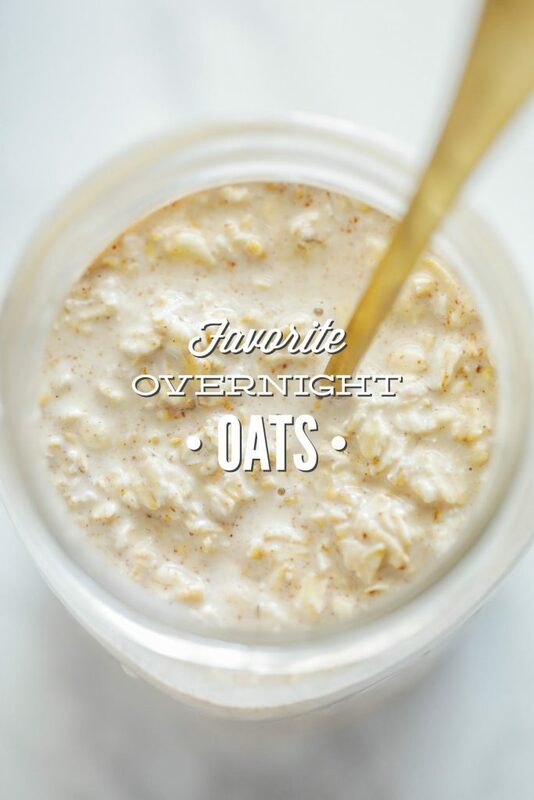 My favorite recipe starts with the typical overnight oat ingredients: rolled oats and milk. Steel cut oats are added for extra texture. Yogurt is added for the probiotic benefits. Yogurt also adds “heartiness” to the oats. Cinnamon (ceylon cinnamon), a warming spice, is added to help circulation (hello, early morning) and add a delightful flavor. Maple syrup is added for a touch of natural sweetness. The recipe makes enough for 2-3 breakfasts, and will keep in the fridge for 2-3 days. The oats may be enjoyed cold (my favorite) or warmed up in a saucepan with a bit of extra milk. I like to top the cold oats with fruit (bananas or berries), nut butter, and hemp seeds (for extra crunch). 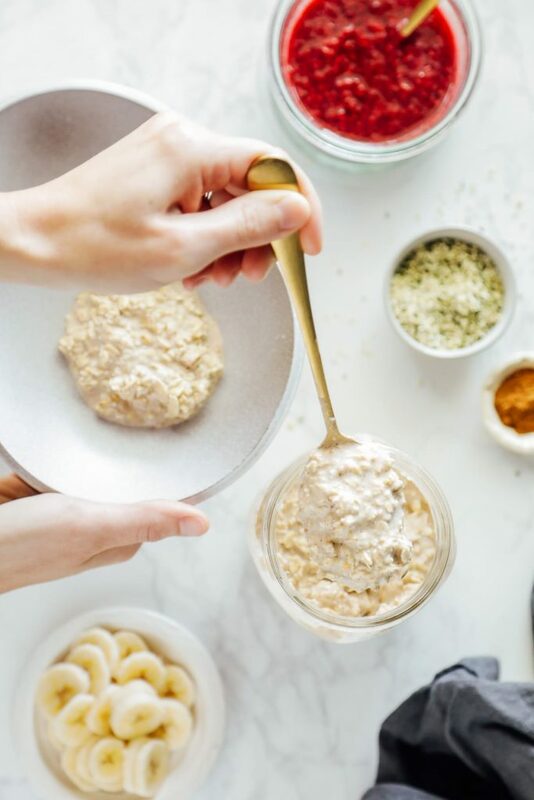 My favorite (make-ahead) overnight oatmeal. The recipe makes enough for 2-3 breakfasts, and will keep in the fridge for 2-3 days. 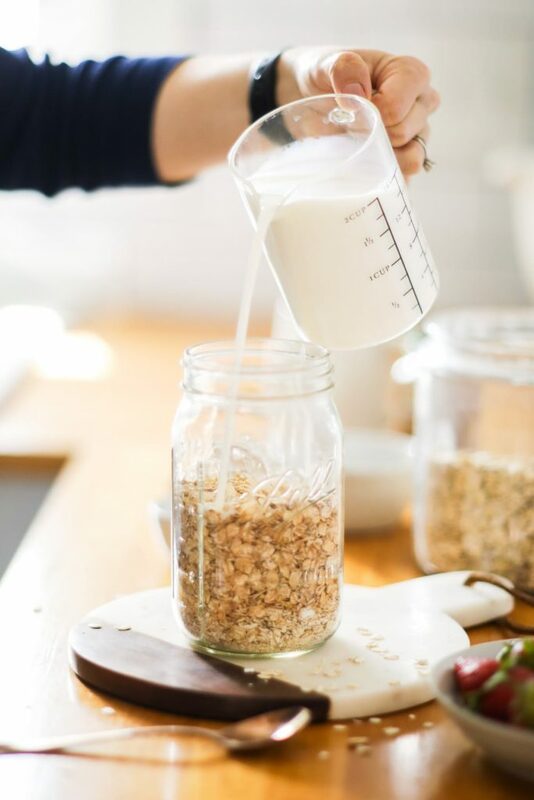 Pour all the ingredients into a quart-size mason jar (except the "Optional Serving Suggestions"), starting with the rolled oats and ending with the vanilla extract. Stir until well combined. Refrigerate the oats overnight. The oats may be kept in the fridge for 2-3 days. 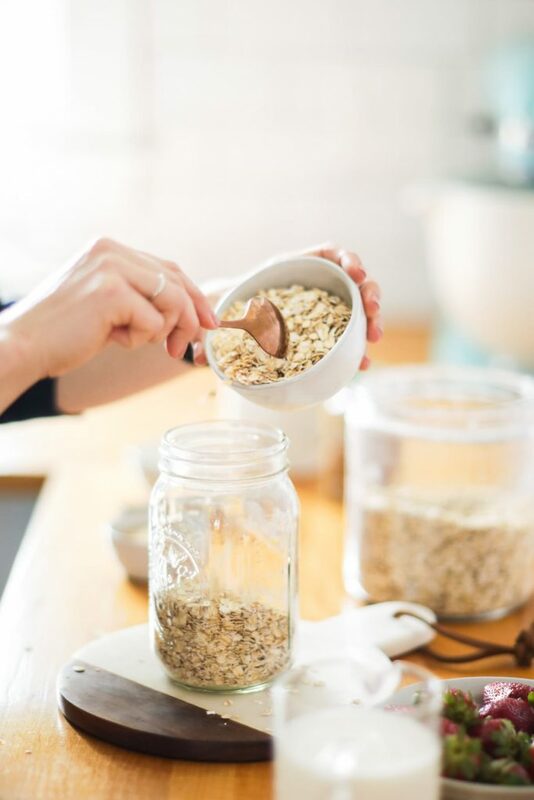 To enjoy, spoon the oats (as much as desired) into a bowl or smaller to-go container. Add any optional serving suggestions to the top of the oats. 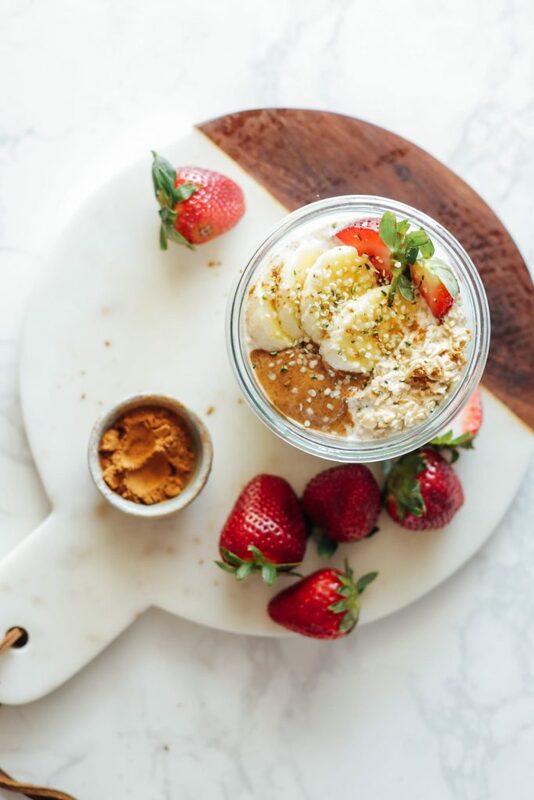 I personally like to top my oats with a nut butter, banana or berries, and hemp seeds. Hi Kristin! This looks great and I’d love to try it, would this recipe work with plain ole cow’s milk? Hey Julie, Thank you! Yes, it will. You may not need as much milk since almond and cashew milk tend to be thicker.